The pavers are laid, the foundation is done and now it is time to build the shed! George Tracy is getting ready to put our water lines in. Sandy Pernitz at Department of Neighborhoods will begin assigning plots March 30. We have two ramps and a stairway built from the upper garden to the lower garden. This week end will be exceptionally productive and all hands are needed! Please join us. Soup is served at noon. Posted on behalf of Sharon Knoll. Another Weekend, Another Show! With More to Come! February 9 – 10 was another productive weekend thanks to the 12 amazing volunteers that showed up. Erik Gundersen’s fabulous plans for our shed are being implemented. We have about 2/3 of the pavers laid for the shed and community area. 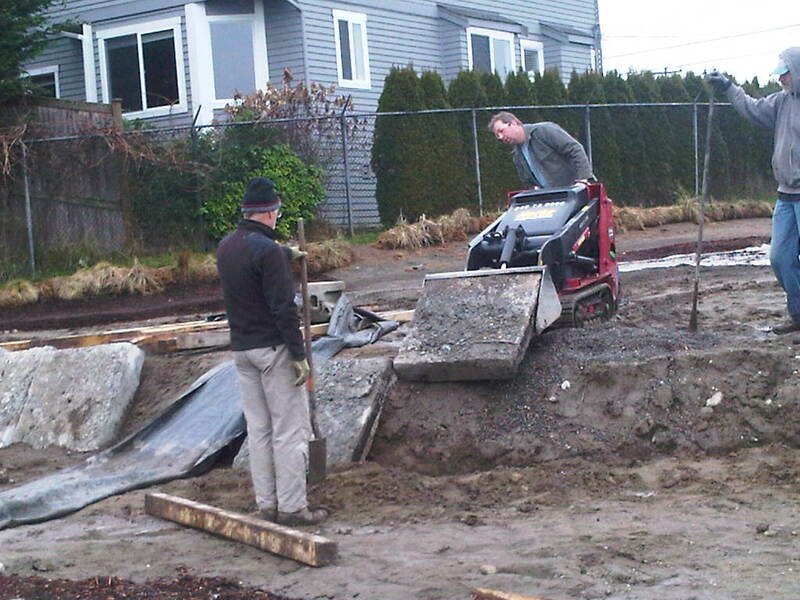 The retaining wall started the week-end of February 2nd is almost complete with back fill of pea gravel. We are having more concrete blocks delivered this week and will start the next retaining wall. The blocks are smaller and should be easier to handle. 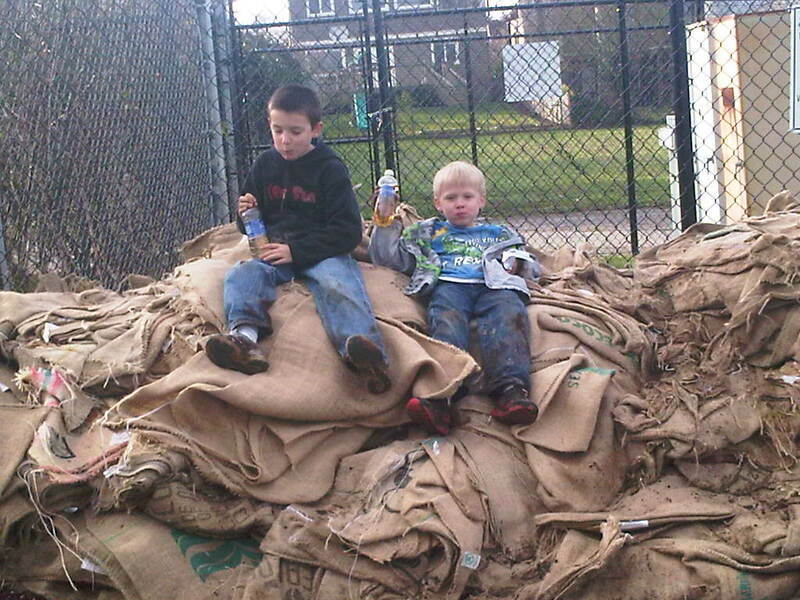 Salmon Bay Sand and Gravel has donated six cubic yards of pea gravel, and given us 50% off on all other materials we order. Mutual Materials has joined in helping by providing a great price cut on the pavers and other materials we needed to lay the pavers. And thanks to Ann for delivering her wonderful soup on Saturday, and to Susan for her wonderful soup on Sunday. Please let us know if you would like to make and deliver food for the volunteers. It counts as volunteer hours. We eat standing up and it really makes a difference! Please do not feel that you need a special skill to join us. There are many things to be done! And shoveling pea gravel and mulch and moving it with wheel barrows is important! Reminder: Please turn in all your volunteer hours through January 31. Please contact Sharon Knoll if you have any questions. We will be having work parties every weekend until we are finished. We project this will take another five weekends. Dog OLA Work Party: Saturday, February 9th! Pitchforks and Shovels and Rakes, oh my! Our monthly Work Party will take place this Saturday, February 9th from 10 am – 12 Noon. Please remember to bring work gloves. We’ll be spreading chips, moving gravel & planting in the south border. Please be aware of the chip & tool delivery. It should take place between 8 and 10 am. During the delivery, the work gate will be OPEN and the Off Leash Area WILL NOT be secure. Please watch your dogs and corral/leash them appropriately! Contact Toni Imfeld for more info. Work Party Projects Week End of February 9, 10 – 10:00 a.m. – 2:00 p.m.
Mutual Materials in Bellevue has given us a substantial price break on the price of the pavers and we thank them. And Salmon Bay Sand and Gravel has once again come through with a price break with the 20 cubic yards of pea gravel they are donating. We need everyone, not just ‘skilled’ people to come help. Please join us. We do have fun and we even get to rest sometimes! 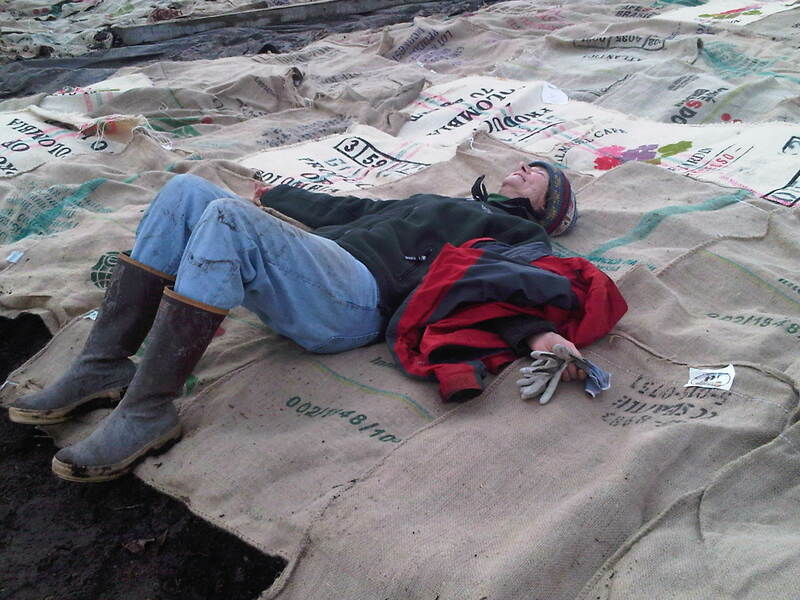 We had 11 volunteers and moved leaf mulch to the plots and covered with burlap bags. 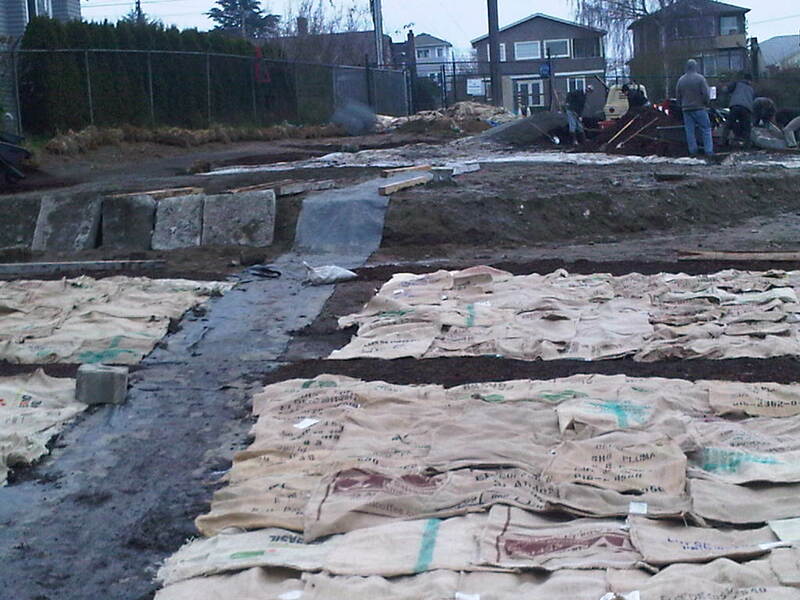 We had 35 huge blocks of concrete ( 3 ft x 3 ft x 8 inches) and began building our retaining walls. 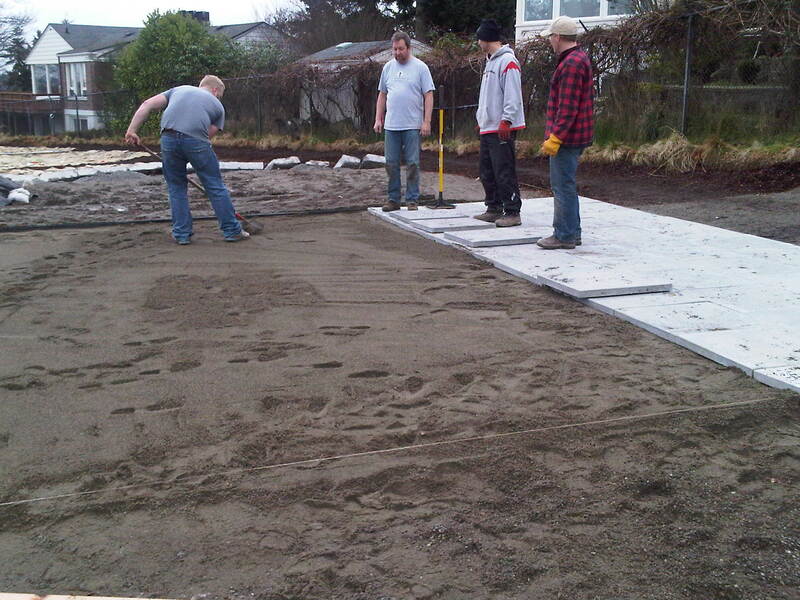 Hats off to Salmon Bay Sand and Gravel Co., who graciously donated and delivered 6 cubic yards of pea gravel for the retaining walls and the shed foundation.